For more information, contact Donna Harrison at donna@unitedstations.com or call 301-203-0315. Boost your market ratings with AccuWeather, the world’s largest and fastest growing weather company. AccuWeather has grown from 200 affiliated stations in 2009 to more than 800 stations in 2017. 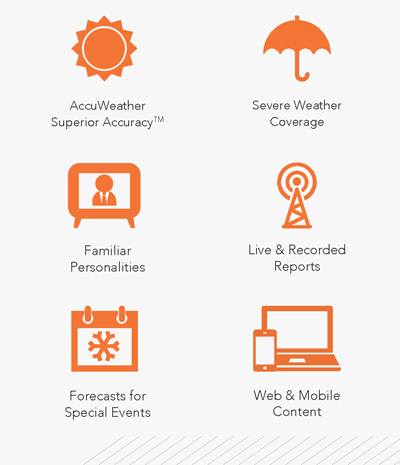 There’s a reason AccuWeather is a recognized leader in innovation and digital media. With more than 100 meteorologists on staff, AccuWeather is the most trusted source for weather alerts, news and updates. Combine the power of AccuWeather with your radio station’s local credibility and take your broadcast offerings to the next level. AccuWeather is partnered with United Stations Radio Network (USRN), a leading radio network, to help you expand your market reach and effectiveness. AccuWeather provides crisp, lively and highly accurate reports for any radio format telling your listeners what they need to know in the local forecast without complex jargon. With propriety features such as the AccuWeather RealFeel™ temperature - which considers multiple weather factors to calculate how it actually feels outside and MinuteCast® - which forecasts Minute-by-Minute precipitation at a hyper-local level, AccuWeather gives straight-forward forecasts that are localized to your specific coverage area and tailored for your station. 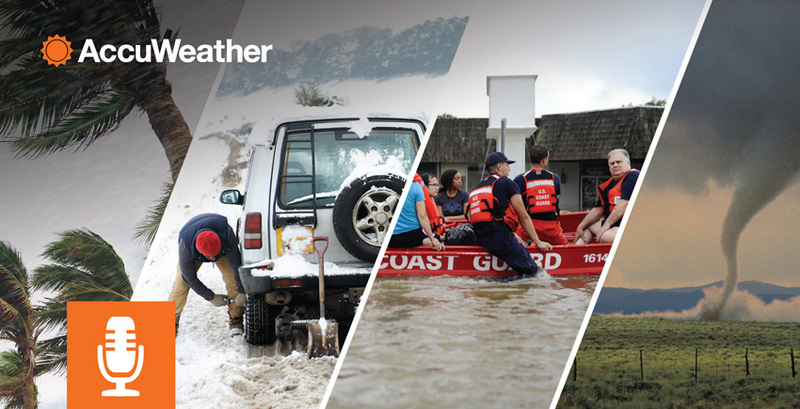 Serving 1,700 media clients across television, newspaper, and radio industries, AccuWeather is committed to providing the best for our clients, partners and their audiences. Detailed local weather discussions and live Q&A’s attract listeners and can provide premium sponsorship opportunities. With exclusive forecasts and lively features, targeted specifically to your unique format, market and listeners. AccuWeather provides numerous sponsorship opportunities through informative and engaging content presented by top-rated communicators. Highly promotable and unique features like AccuWeather’s RealFeel™ temperature and MinuteCast™ give your programming the edge you need in your market to increase your brand awareness and revenues. AccuWeather provides exceptional, dedicated coverage around the clock for your listeners by our expert team of meteorologists. They are there for you, 24/7/365, especially during severe weather events such as hurricanes, tornadoes, thunderstorms, flooding, heavy winds, snow, blizzards and more. We concentrate exclusively on what your station needs, when you need it most. To learn more about the AccuWeather Radio Broadcast Service, call United Stations Radio Networks at 212.536.3673 or email donna@unitedstations.com. "On behalf of everyone here at 850KOA, I want to thank you and your team for the excellent service you provided to our listeners during yesterday's on-going weather events in the Denver Metro Area. The amount of hail, rain, lightning and possible tornado sightings are what everyone is talking about today! The storm woke many of us up overnight and it was your fine coverage and helpful communication that made our coverage complete. We were on it, thanks to you and team Accuweather." "AccuWeather correctly forecast Floyd to stay 700 miles east of Florida, while others had it nearly make landfall. When it comes to hurricanes and severe weather, no one is more accurate than Accu Weather." "AccuWeather issued a forecast predicting the target of Katrina’s landfall nearly 12 hours before the NHC (National Hurricane Center) issued its first warning, and argued the extra time could have aided evacuation of the region." "We have been an AccuWeather affiliate through United Stations for two years now. It is a fantastic service! I've had local Police and Municipal officials tell me how much they appreciate the accuracy of our weather forecasts since we've switched to AccuWeather. Listeners have commented about our forecasts being more accurate than the regional TV weathermen, and advertisers on our weather forecasts are extremely satisfied." "During the recent severe weather outbreak, the up to the minute texts and emails from AccuWeather allowed WIFE to keep our listeners up to date. Our relationship with AccuWeather has allowed us to become the premiere station in our coverage area for accurate weather forecasts. The AccuWeather team delivers what we need when we need it, and when severe weather breaks out, they are there for us. Interesting to note, their forecasts are more on target than the TV Meteorologist we used for years out of Indianapolis."